In this article, we will explore the reasons behind the depreciation of sp-pnp-js, what there is in @pnp/sp, and how we can transition our code from sp-pnp-js to @pnp/sp. SharePoint Patterns and Practices (PnP) had introduced the sp-pnp-js to simplify common operations with SharePoint and SPFx. The sp-pnp-js had provided various wrapper APIs to perform operations with SharePoint in an efficient way and with less code. The sp-pnp-js had taken away the complicated work to form REST requests, processed the JSON responses and thus let developers concentrate on the actual business logic. The sp-pnp-js was a huge package of single JS handling multiple responsibilities (e.g. performing SharePoint operations, logging, performing operations with MS graph, taxonomy, etc.). As a result, it was a very bulky package. The single sp-pnp-js package was broken into multiple packages that give developers more control and bring in only required pieces to their solutions. This also gives the flexibility to update the required package individually. Follow the below steps if you do not have a prior project with sp-pnp-js. Solution Name: Hit Enter to have a default name (spfx-sp-pnp in this case) or type in any other name for your solution. 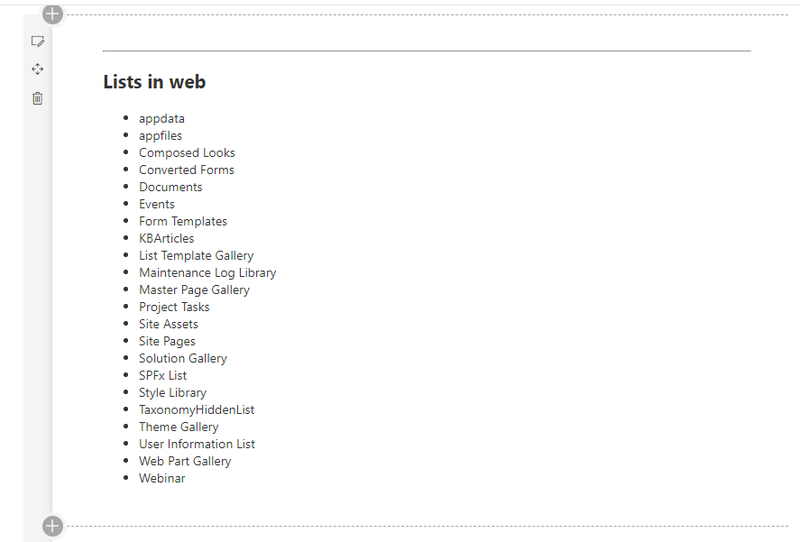 Target for component: Here, we can select the target environment where we are planning to deploy the client web part, i.e., SharePoint Online or SharePoint OnPremise (SharePoint 2016 or 2019 onwards). Selected choice: SharePoint Online only (latest). Type of client-side component to create: We can choose to create a client side web part or an extension. Open the command prompt, type the below command to add sp-pnp-js npm package to project. On the command prompt, type the below command to open the solution in a code editor of your choice. Open the web part file at \src\webparts\helloPnP\HelloPnPWebPart.ts. Write onInit() method to configure spfx context. Locate and add the webpart to page. 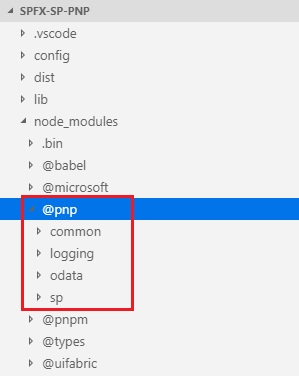 On the command prompt, type the below command to add sp-pnp-js npm package to project. The new @pnp/sp package will appear under node_modules. We will now update our imports to @pnp/sp. Update the code to make use of new @pnp/sp imports. The “pnp” references are replaced with “sp”. From the command prompt, type “gulp” serve to test the webpart after @pnp/sp transition. On the UI front it looks the same as it was before (with sp-pnp-js implementation); however, we have upgraded the solution behind the scene to a newer package. 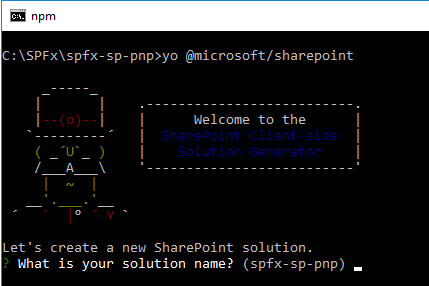 sp-pnp-js was introduced to simplify common operations with SharePoint and SPFx. However, it was one big bulky file with all functionalities together. SharePoint Patterns and Practices (PnP) have broken it in to multiple packages that give developers more control and brought in only required pieces to their solutions. As the old sp-pnp-js package is deprecated, to align with future updates it is advisable to start using new @pnp/sp packages and start transitioning old solutions to new @pnp/sp packages.